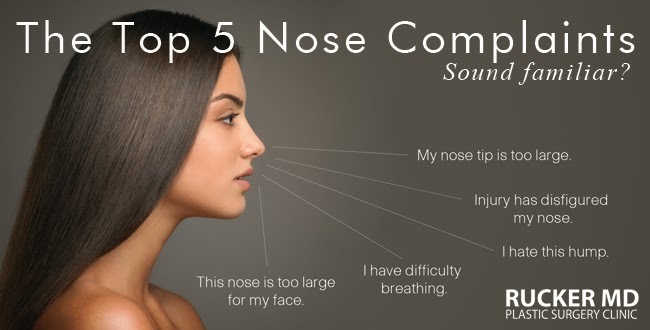 The Top 5 Nose Complaints. Sound Familiar? While we can often disguise protruding ears with different hairstyles and soften the appearance of our eyes with makeup, the nose is the most noticeable facial feature and is more difficult to hide or disguise. In the 500+ Rhinoplasty procedures that I have performed, I have employed a highly focused individualized approach which avoids the dreaded “operated on” or “done” appearance. FUNCTIONAL nasal problems usually arise from an injury and result in a disfigurement of the nasal shape with complaints of obstructed nasal breathing. Most functional Rhinoplasty candidates have sustained an injury to the nose that has resulted in a possible nasal fracture and/or displacement of the internal partition of the nose, which separates one nostril from the other. The most common concerns – difficultly breathing through the nose and severe headaches. The nose may appear disfigured, often identified by a hump at the mid-portion of the bridge. An internal examination may confirm that there is, in fact, a deviation of the nasal partition resulting in a partial blockage of nasal airflow. We then would develop an operative plan to restore the displaced nasal structures to their original position, and to rearrange the displaced nasal partition in an effort to restore normal nasal airflow. The reconstruction of a functional nasal problem is usually covered by one’s insurance. COSMETIC nasal problems include the above complaints of “my nose is too large”, “I hate my hump” or “the tip is too large”. These are characterized as cosmetic because their improvements do not affect the function of the nose and the ultimate goal is to produce a better appearance of the nose. I refer to this type as an “aesthetic” Rhinoplasty. It is important to understand that the shape of the nose is dictated by the bone and cartilage framework beneath the skin. It is therefore the goal of the cosmetic nasal surgeon to reshape the framework beneath the skin to reduce the size and shape of the nose, without producing a result that looks “done”. In the case of an aesthetic Rhinoplasty, I feel the most important aspect of the initial consultation is to determine whether the results of the procedure can realistically meet the patient’s expectations. Difficulties can arise when a patient states, “I want my nose to look exactly like this,” and presents a photo of a celebrity. This type of result is often not realistic, firstly, due to other facial features contributing to the nasal appearance, and secondly, because the nasal framework may not allow a specific result. 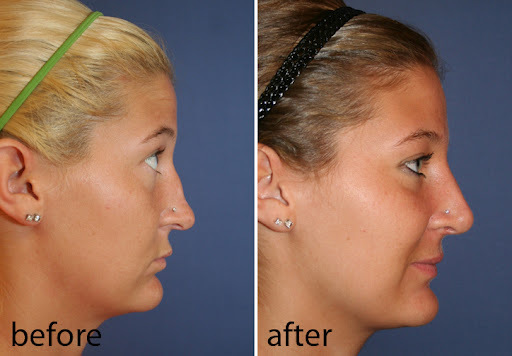 However, certain characteristics of someone else’s nose may be incorporated into each individualized Rhinoplasty. A detailed examination of the candidate is performed and an operative plan to address the patient’s concerns is formulated. Because this is a purely cosmetic procedure, it is not covered by insurance. The Nasal (Rhinoplasty) Procedure: Both functional and cosmetic procedures are done under a general anesthetic and on an outpatient basis. Each procedure takes about two hours to perform. Most patients rate the pain on a scale of 1 to 10 as a 4 to 6. There is a dressing in place for 6 to 7 days, and upon its removal the patient’s result is noted with a moderate amount of swelling. Patients typically feel comfortable being in public after Rhinoplasty in seven to eight days.